Walt Whitman was born, the second of nine children, in Huntington, Long Island, New York, on May 31, 1819. His ancestors and family had lived in the West Hills area of South Huntington for over 125 years. Walt Whitman’s Birthplace, a State Historic Site listed on the National Register of Historic Places, still stands and commemorates his nativity. The farmhouse was constructed by the poet’s father Walter Whitman Sr., a house builder, upon his marriage to Louisa Van Velsor in 1816. During 1823, the family moved to the city of Brooklyn where Walter Sr. continued building houses to support the growing family. Although Walt Jr., the poet, attended grammar school, he took his first job at age twelve as a printer’s devil at The Long Island Patriot. A voracious reader, he was largely self-educated, and by 1835 was a printer in New York City. An economic depression and lack of opportunity in the newspaper field, however, forced him to return to Long Island with his parents and family the following year, and remained there until 1841. During this time he commenced a series of teaching positions in eight different school districts throughout the western half of Long Island. However, he continued to pursue his literary and journalistic interests by dabbling in conventional poetry, short stories, and a novel. He also founded Huntington’s weekly newspaper, The Long-Islander in 1838, but then sold the business a year later. 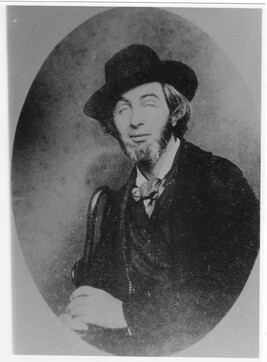 After 1841, Whitman returned to journalism as a full time career until 1859. He held editorial positions on seven different newspapers, four of them on Long Island, two in New York City, and one as far away as New Orleans. In all of these positions he was an outspoken advocate of social, economic, and political reform in both local and national issues. The local papers were The Long Island Star, 1845; The Brooklyn Weekly Eagle, 1846-1848; The Brooklyn Freeman, 1848-1849; and the Brooklyn Daily Times, 1857-1859. During the spring of 1855 Whitman published the first edition of Leaves of Grass. It was a thin volume of poems written in a highly innovative style. Unable to find a publisher, he employed his Brooklyn friends, the Rome brothers, to print it. The book was advertised and distributed by Fowler and Wells of New York City. Although it did not sell well, it was praised by noted intellectuals such as Ralph Waldo Emerson and found acceptance among progressively minded Americans. The book contained twelve untitled poems, the first of which later became “Song of Myself.” In this poem, Whitman used his own individuality as a measure of self, presenting his own soaring spirit as synonymous with that of the American people. He was a personal as well as a political poet. Leaves of Grass never became part of any literary establishment. It seemed strange to most of the poet’s contemporaries; but today it is considered a masterpiece of world literature. It has been translated into French, German, Italian, Spanish, Russian, Ukrainian, Japanese, and Chinese. The book is a poetic summary of Whitman and his fellow Americans; true American poetry without any European inspiration. Between 1855 and 1892 it went through six editions and nine successive printings during his lifetime. In each edition Whitman made alterations or deletions, but the book grew apace with the nation. At the beginning of the American Civil War, upon learning that his brother George Washington Whitman had been wounded, Walt left Brooklyn to search for him among the field hospitals of Fredericksburg, Virginia. Shocked by the plight of the wounded, he changed his residence to Washington D.C. and secured a civil service post in the Department of the Interior. This allowed him, over the course of the war, to make over 600 visits to the military hospitals around the capital to comfort and care for the wounded as a volunteer nurse. Walt lived in the nation’s capital until a stroke forced him to move close to his brother George and his family in Camden, New Jersey in 1873. His experiences in Washington provided him with material for a new addition to Leaves of Grass entitled “Drum Taps”, and changed his poetic focus. He was no longer a just poet from New York or Long Island; he now belonged to and spoke for the nation. Walt spent the remainder of his life in Camden, New Jersey. The 1881 seventh printing of Leaves of Grass sold well and allowed him to purchase a house on Mickle Street. Walt filled his time with travel, revising Leaves of Grass, overseeing new prose and poetry with the help of friends such as Horace Traubel. 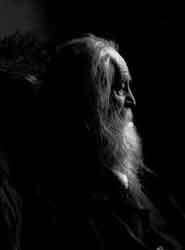 He corresponded with and received visits from international literary personages such as Alfred Lord Tennyson, England’s Poet Laureate; Bram Stoker, author of Dracula; and poet & playwright Oscar Wilde. His final edition of Leaves of Grass appeared in 1892, the same year he died. By the end of his life, Whitman had become the first American poet to achieve international acclaim. Today his poetry is available in every major language and continues to inspire people worldwide who find in Whitman the voice and vision of a truly international humanist. This is a 36-second wax cylinder recording of what is thought to be Whitman's voice reading four lines from the poem "America." For more information on this recording, see Ed Folsom, The Whitman Recording," Walt Whitman Quarterly Review, 9 (Spring 1992), 214-16.